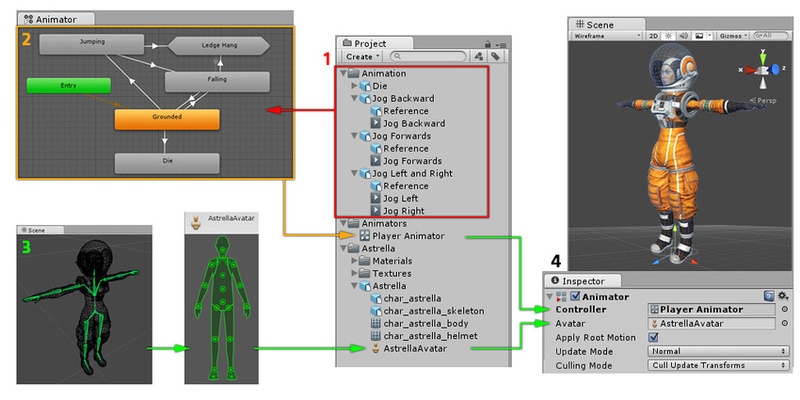 The Animator component is used to assign animation to a GameObject in your scene. The Animator component requires a reference to an Animator Controller which defines which animation clips to use, and controls when and how to blend and transition between them. Normal The animator is updated in-sync with the Update call, and the animator’s speed matches the current timescale. If the timescale is slowed, animations will slow down to match. Animate Physics The animator is updated in-sync with the FixedUpdate call (i.e. in lock-step with the physics system). You should use this mode if you are animating the motion of objects with physics interactions, such as characters which can push rigidbody objects around. An animation clip contains data in the form of “curves”, which represent how a value changes over time. These curves may describe the position or rotation of an object, the flex of a muscle in the humanoid animation system, or other animated values within the clip such as a changing material colour. Curves (Pos, Rot & Scale) The total number of curves used to animate the position, rotation or scale of objects. These are for animated objects that are not part of a standard humanoid rig. When animating a humanoid avatar, these curves would show up a count for extra non-muscle bones such as a tail, flowing cloth or a dangling pendant. If you have a humanoid animation and you notice unexpected non-muscle animation curves, you mave have unnecessary animation curves in your animation files. Muscles The number of muscle animation curves used for humanoid animation by this Animator. These are the curves used to animate the standard humanoid avatar muscles. 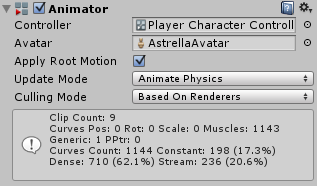 As well as the standard muscle movements for all the humanoid bones in Unity’s standard avatar, this also includes two “muscle curves” which store the root motion position and rotation animation. If your animation clips are imported with “Anim Compression” set to “Optimal” in the Animation import reference, Unity will use a heuristic algorithm to determine whether it is best to use the dense or stream method to store the data for each curve.